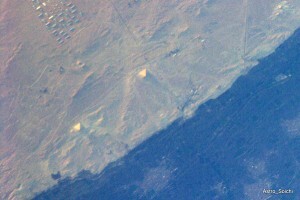 Today, my favorite source of friendly astronomy-news commentary, Phil Plait (BadAstronomy.com) published a post regarding a new picture taken by Soichi Noguchi, an astronaut on board the International Space Station, clearly showing the pyramids of Egypt from space. That means, of course, that the Great Wall of China is not the only man-made object that can be seen from space. I agree with Phil about this conclusion. However, these questions of man-made objects seen in space is a long-time pet-peeve of mine, and I couldn’t just let this go. There’s no doubt we can see man-made objects from space. Depending on your definition of space. See, space is huge, HUGE, and the border between Earth’s atmosphere and Space is less clear-cut than many think. This renders the question itself – Are man-made objects visible from space? – moot. Is space 400km above the Earth, or is it 30,000km above the earth? 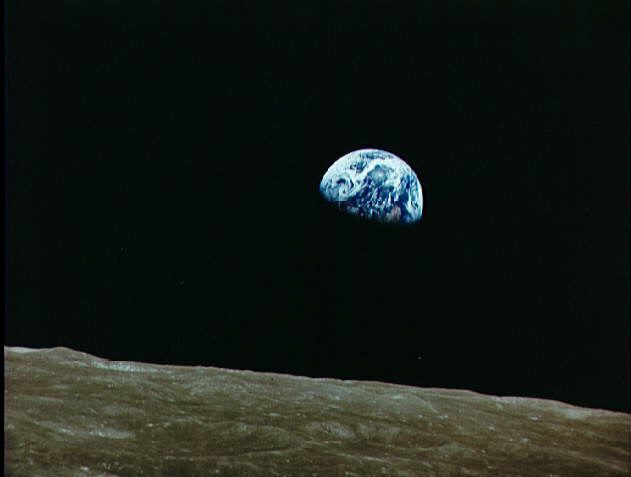 Whether or not we can see man-made objects on the surface of the earth depends on how far away we are when we look. Case in point – the International Space Station is somewhere between 336 to 346 km above the surface of the Earth at any given moment. Some man-made communication satellites are about 30,000km above the equator. What’s visible from the space station might not be visible from our man-made communication satellites. Notice the differences here: The ISS is proximately 400km above the Earth’s surface, and our communication satellites are around 30,000km above the Earth’s atmosphere. That’s almost 100 times farther away. So that’s what the pyramids look like from space. Hrm. The.. the pyramids.. wait.. uh.. the pyramids? Where did they go? As you can see, it’s very hard (if at all possible) to see the pyramids in the second teeny tiny picture. And yet, that’s their relative size from a 30,000km altitude – about 1% size of the original picture. So Can We See the Pyramids From Space? We can see the pyramids in space, when space is around 400km above the Earth. Actually, we might be able to see the pyramids from 30,000km if we have better resolution in the picture, but the farther out you go, the harder it is to make up items on the Earth’s surface. That includes the pyramids, and the wall of china, and the super-dome. You can see neither of those from the Moon. The same can be said about moving closer to the Earth’s surface. The border between the Earth’s atmosphere and outer space isn’t clear cut at all. The earth’s atmosphere becomes thinner and thinner as you venture outwards, and it doesn’t just end in a clearly discernible line. At around 175km above the earth’s surface is where shuttles returning to earth begin feeling a discernible effect from the atmosphere, so we often take that limit to be the “edge” between the Earth and outer space. If you go to that height, though (half the height from the ISS to the surface of the Earth), you could see much more than just the pyramids. And it is still Space. When you’re in Battery Park, you can see the Statue of Liberty. When you’re on top of the Empire State Building, you will likely need binoculars. We all know this simple fact: It’s harder to make out objects the farther away you are from them. We don’t need to go to space to see this, it’s enough that we board a plane and fly above our city. When we are on the ground, we can make out people and buildings. When we are on the plane, we can only make out buildings. When the plane is very high up in the air we can only see clusters that we recognize as cities. From the International Space Station, we can obviously see the pyramids. Does that mean the pyramids are visible from space? From the distance of communication satellites, we probably can’t see the pyramids. Does that mean that the pyramids aren’t visible from space? From the moon, it’s almost impossible to recognize any feature other than landmass on the surface of the Earth. Does that mean no man-made objects are visible from space? It all depends on what you mean by “space”. If you think you can make out any detail other than landmass (the wall of china? the pyramids? anything else? ), then I’d love to get to know your optometrist. Is he taking new patients? Space isn’t a finite point, it’s an unclear range that seems to start around 160km above the Earth (more or less) and ends … well… at the edges of the universe, some 46.5 billion light years away. We can barely make out our own planet from the edge of our own solar system. Do you think we can see man-made structures from the center of our galaxy? Of course not. Does that mean they are not visible from space? So, when I am asked this question – “Can we see the wall of china from space? Can we see the pyramids from space?” my answer is simple: Sure we can! It just depends how far out you go. Smartassy, maybe, but more accurate.